The passenger compartment of the Prius remained stable in the frontal offset test. Dummy readings showed good protection of the knees and femurs of the driver and passenger. Toyota showed that a similar level of protection would be provided to occupants of different sizes and to those sat in different positions. 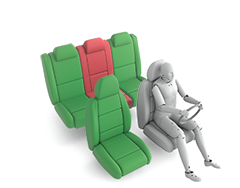 Driver chest protection was rated as marginal, based on dummy readings of compression In the full-width rigid barrier frontal impact, protection of both the driver and rear passenger dummies was rated as good, except for the chest, protection of which was adequate. In the side barrier test, the Prius scored maximum points with good protection of all critical body areas. However, in the more severe side pole test, dummy readings of lateral rib compression indicated weak protection for the chest, all other body areas being well protected. 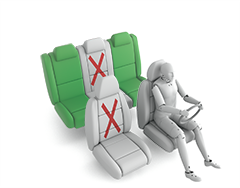 The front seats and head restraints demonstrated good protection against whiplash injury in the event of a rear-end collision and a geometric assessment of the rear seats also indicated protection for those occupants. 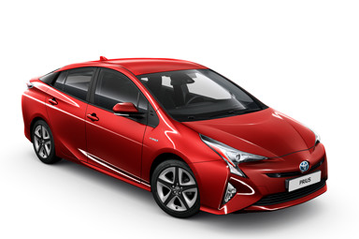 The Prius is equipped as standard with Toyota Safety Sense which includes a low speed autonomous braking system. Euro NCAP's tests revealed good performance of that system, the car scoring maximum points. In the frontal offset test, the Prius showed good protection of all body areas for the10 year dummy, and all apart from the chest for the 6 year dummy. Chest accelerations were marginally elevated for the 6 year old's chest. In the side impact, maximum points were scored for both the 6 and the 10 year dummy, with good protection of all critical body areas. The front passenger airbag can be disabled to allow a rearward-facing child restraint to be used in that seating position. Clear information is provided to the driver regarding the status of the airbag and the system was rewarded. The protection offered by the bonnet to the head of a struck pedestrian was predominantly good or adequate with poor results recorded only at the base of the windscreen and on the stiff windscreen pillars. The bumper scored maximum points, with good results at all test locations. Protection of the pelvis was mostly good with some areas of weak protection at the outboard edges. The Prius's autonomous emergency braking system is able to detect pedestrians. In Euro NCAP's tests, the system performed well, managing to avoid a collision or mitigate the severity in the great majority of cases. avvicinamento a un veicolo fermo Vedere AEB urbano Impatto evitato fino a 80 km/h. Toyota Safety Sense is standard equipment. It includes an autonomous braking system which operates at highway speeds and showed good performance in Euro NCAP's tests; a lane assistance system which warns the driver if he is drifting out of lane, and helps to correct the departure; and a camera-based speed assistance system which informs the driver of the appropriate limit, allowing him to set the speed limiter as appropriate.